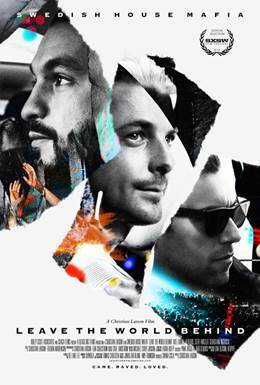 Breaking up is never easy, and saying sorry can sometimes be just as tough – so it seems for Swedish House Mafia in Leave the World Behind, the new film from Christian Larson which documents the trio’s final million-ticket-selling world tour. It begins with show number one of fifty – the lights come up, tens of thousands of people are screaming, arms up and open wide. The words flash up on a giant screen We Come, We Rave, We Love. A curtain the size of the Vancouver Dam falls from the stage to reveal Axel ‘Axewell’ Hedfors, Sebastian Ingrosso and Steve Angelio a.k.a Swedish House Mafia. The beats erupt, the arena explodes into an all out assault on the senses, and for several minutes, you feel you are part of it; that you’re sharing that experience with those who were really there. There’s no doubt about it, Swedish House Mafia are a musical force to be reckoned with. Or sadly, ‘were’ a force to be reckoned with, because this is there last ever tour and the last time these adoring beat-seekers will see their heroes perform on stage together. But why? Is it down to all the regular clichés? The drugs? The personality clashes? Too many T.V.’s out of too many hotel windows? The problem is, I’m still not sure, and I don’t think they are either. Leave the World Behind conveys a band in a constant state of frustration and disarray. They don’t hate each other, but are downright scared that they might start hating each other. The fans don’t want them to break up, and at times, they don’t particularly want to break up either, but something has become amiss between three guys who started out as just three friends out to spend every night on stage as if it were their last. The good times clearly can’t last forever. Things change and of course, people do too. Larson tries to show us these changes. From party people to family men, some differences a clear, but these are in contradiction to other things we see; leaving the family to work on material, only for the interest of certain members seeming to waiver. There’s an elephant in the room, but this is a band hell bent on partying around it as opposed to blasting it away with those massive beats. The anger and frustration of three friends growing apart but still tied together by the most wonderful thing they have created is clear and yet no-one seems to have the guts to just come out and speak about it. Perhaps that’s just human nature and in real life, some questions will always go unanswered, especially when friendship is on the line. Although it seems Swedish House Mafia would be in a far better place if they were just honest and communicated properly with each other. Larson gives us real insight into what made this trio such a giant in contemporary music and how their songs touched millions of fans. He also manages to show us the other side of being in a band with friends, and although this is by no means new territory to cover, it’s still a sad sight to see these guys drifting apart and completely unsure what to do about it except push the eject button. In the end, they sign off as a band that went out on top. A brave decision, but in light of Leave the World Behind, perhaps one made of less heroic choices. If you can’t confide in your friends, who can you confide in? Leave The World Behind hits selected theaters in March.